So, I am actually thankful for this episode because it helped put to rest one of the issues that had been bugging me regarding Nora and Iris and pitted the true problem where it squarely belonged-right at the feet of The Flash. It was also a nicely timed and sweetly told reveal of our villain's origin- though my problems with his portrayal continue to remain. Let's get to it. The holidays are always that time of year where feelings become extra feelings for most families so why should the West-Allens be any different? (It's especially true for our favorite scarlet speedster- though Barry usually reserves his extra feelings for the Xmas season.) This year, Nora decided that she would bare her soul to her father. Now, I'm not mad at the journey she took to get to her epiphany, but I have to say though it was extremely sad, it was a bit silly that someone her age had not factored the meaning of sacrifice into the equation of what it means to be a hero. She flatly rejected Barry's comparison of Joe going off to police the city, which is kind of the same thing. Just as Joe is never sure if he will come back, Barry isn't either; they both intend and hope to though. Both have to trust that their partners or teams will be able to get them out of a jam if they can't do it themselves- but anywho. Nora has also grown up idolizing Barry's feats in the Flash Museum. It never occurred to her that a giant talking shark might really be dangerous to the city or to her father? To call a wormhole epic and something that she would have liked to witness was bizarre when Iris had a look of fear on her face recalling the night. If she was thirteen, I could have roundly accepted her thought pattern. This is my biggest issue with Nora's presence in the present; she acts too much like a kid so they should have probably made her travel back as one. It would have made so much more sense if they wanted to stick her with these childish traits. Seeing Barry die was extremely traumatic and set off so many panic signals for Nora, but as an adult and as someone who has chosen to wear a suit to save people and someone who chooses to actively dismiss any guidance from the one person who can help her understand her father and possibly herself (Iris), I find it very difficult to stay sympathetic for long. I hope this changes for me. The show runners said it would be rough goings for a while and they weren't kidding. Adults talk things out. They don't storm off and lurch from one emotion to the next unless they are dealing with instability issues. Why haven't Nora, Iris, Barry, and maybe even Joe had "the real talk"? I know there's fear of revealing things that may alter the timeline, but it is high time. The side conversations with one parent while the other is left to interpret or hear second hand is old. When the three of them did briefly interact, Barry told Nora that he was choosing Iris' side of things. That was a start. Now, go deeper. Nora has to understand why Barry IS The Flash- why they all are The Flash in some respects. This episode scratched the surface. Iris explained it perfectly in "Run, Iris Run" once she was able to experience it, but she knows Barry. Nora doesn't. Nora needs to know what her father experienced when he was in the Speedforce-what it revealed to him about himself. The toll of losing his parents- the whole nine yards. And the same goes for Nora's understanding of Iris. They need to come to that understanding as a family. Not as Iris and Nora or Barry and Nora or Papa Joe and Nora- together. Orlin Dwyer's origin story is very touching and makes his crusade against meta humans understandable; It's a far cry from the cerebral Thinker's manifesto or the selfish speedsters who just crave more speed and Barry's utter destruction- it's noble and crazy of course- but it's something that most people can relate to. The self-loathing bachelor who has nothing to live for turned loving and doting father figure whose kid has been harmed or killed. It's great motivation for revenge, and the parallel that he will have with Barry will add emotion and complexity to ultimate their face-off. It was already difficult for him to kill Flash when he had a chance once he heard Nora yell "Dad"; then we got the scene where he actually saw Flash saving the city from the reckless meta-humans. So just how will Orlin square that circle? A meta-human who actually uses his powers for good doesn't fit neatly into his revenge fantasy. Interesting. I like! Ah, but Orlin Dwyer is very interesting. It's the Cicada part that isn't. Cicada's story is heart-breaking and one can understand how angry and violent he has become. But being angry and violent and looking angry and violent aren't always the same. Chris Klein as Orlin Dwyer is on point-ordinary and coming to terms with his new role as a uncle/father seemed to come naturally- being Cicada is something all together different. The grimace, ( I get the voice now- a punctured lung makes his voice raspy) the eye twitching, vein bulging out of the forehead- it's over the top. Please stop. It takes away from the character. We know Cicada is angry, wants revenge, is hurting, but I can't take him seriously. It's a good villain- don't ruin it. *Where was Ralph? Was he even mentioned? I actually missed him. What a turn around from last season. *The fathers and daughters thing was cute: Weather Wizard/Weather Witch, Orlin/Gracie, Barry/Nora. *Killer Frost showing up to scold Cisco and Sherloque was a nice touch. *Nora can be really nasty to her parents. Even if she's upset with them-damn girl! Neither one of her parents is like that so it's strange. *Cisco's quip about Twister and Helen Hunt- he is too much! *That doctor- Iris, do some digging girl. Falsifying records-SMH-Who has hurt you? *Sherloque mentioning colonizers and Barry spitting out that drink had he howling! Did you guys like "O Come, All Ye Thankful"? Let us know! 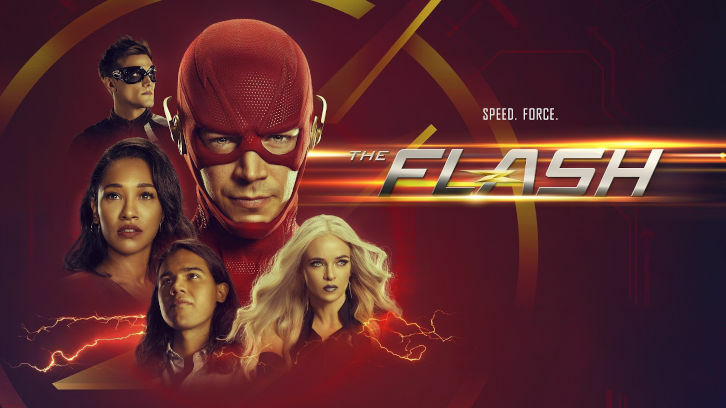 The 100th episode of The Flash airs Tuesday, December 4th! Don't miss it!